In this post, Ashley Smyth writes about her paper “Habitat context influences nitrogen removal by restored oyster reefs”, which was published in the Issue of Journal of Applied Ecology out today. Location matters – where an oyster reef is restored relative to other habitats can influence its affect on nitrogen removal, an important ecosystem service targeted in restoration efforts. Watershed development has increased inputs of sediments, nutrients and other pollutants to coastal ecosystems. Nitrogen pollution in these sensitive ecosystems can lead to algal blooms, eutrophication and dead zones. Luckily, coastal ecosystems have a natural means to remove nitrogen, which can be augmented through restoration and management. 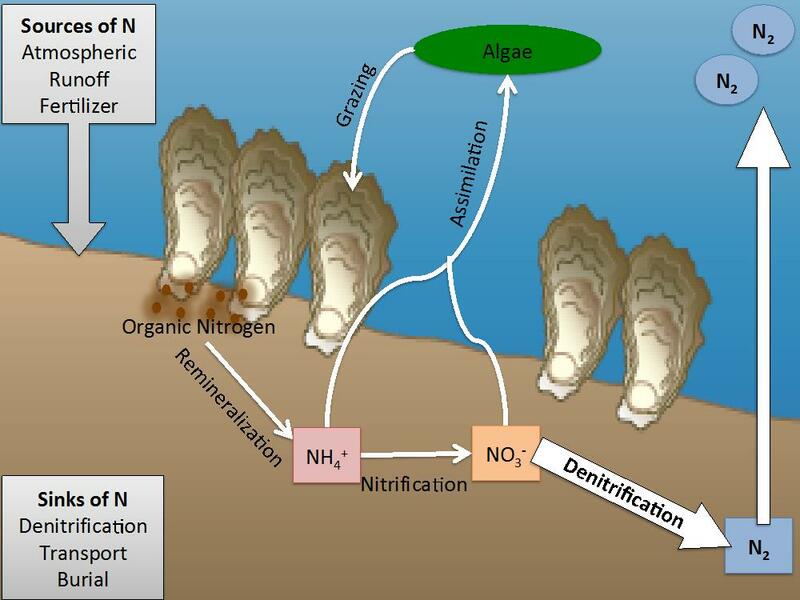 This mechanism is denitrification – the microbially mediated reduction of nitrate, a bioavailable form of nitrogen, to N2 gas, a form of nitrogen that most algae cannot use. Denitrification often occurs in sediments where there is a supply of organic matter and anoxic conditions – two requirements for denitrification. Historically valued only as a fishery, oysters have recently been recognized as vital habitats that provide many ecological services. When oysters feed they move nitrogen in algae from the water to the sediments through the production and accumulation of biodeposits. These biodeposits fuel sediment microbes and, when conditions are right, enhance denitrification. Converting the nitrogen in algae to N2 gas involves a series of reactions and pathways, where there can be leaks and some nitrogen may be recycled back to the water column before it is convert to N2 gas and removed. The efficiency of this pipeline depends on environmental conditions. Sediment Nitrogen Cycling in Oyster Reef Ecosystems: Nitrogen fuels algal growth in coastal systems. As the oysters eat the algae they delivery organic N to the sediments. This nitrogen undergoes a series of complex reactions and some of the nitrogen may be converted to N2 gas and be removed from the system. Oyster reef restoration is now a mainstream approach to control nutrient pollution. However, its effectiveness depends on where reefs are restored. 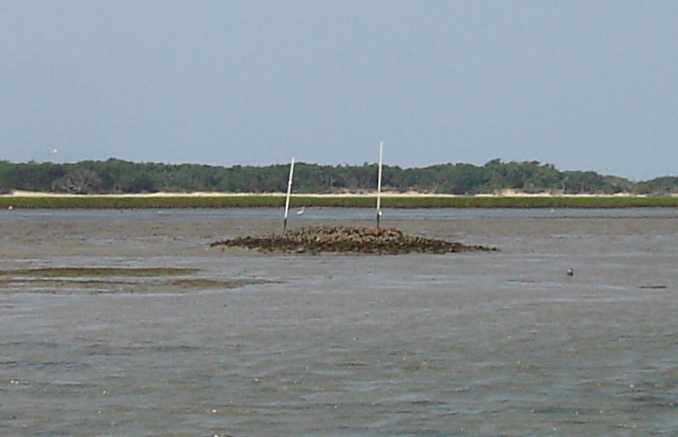 To see how the habitat context of an oyster reef affects nitrogen removal, we measured sediment denitrification rates and calculated denitrification efficiency from oyster reefs restored adjacent to different habitats: (1) on intertidal mudflats, (2) adjacent to saltmarshes and (3) between saltmarshes and seagrass beds. We also measured rates of denitrification from these habitats without reefs to see if the presence of the reef does in fact enhance sediment denitrification. We found that oyster reefs enhanced denitrification by 18–275% over habitats without reefs, with the largest increase occurring when oyster reefs were restored on mudflats. Reefs restored on mudflats had higher rates of nitrogen removal compared to reefs restored adjacent to saltmarshes and seagrass beds. 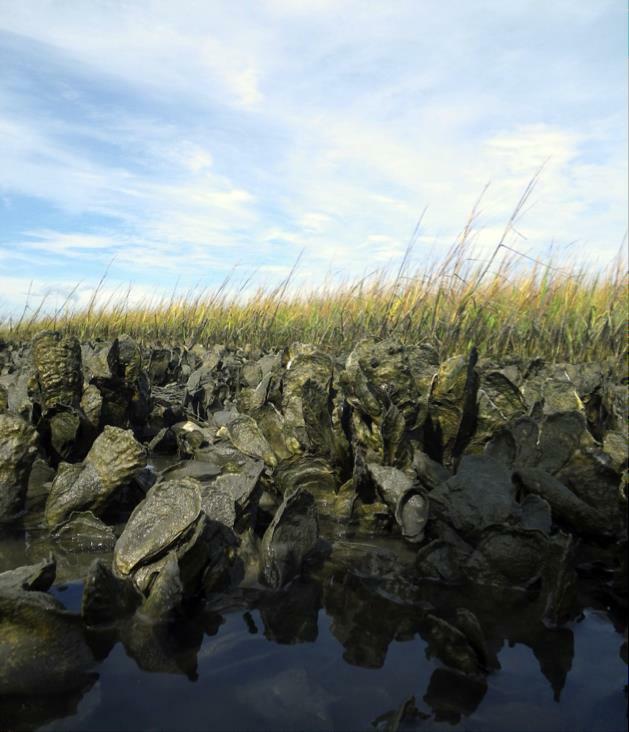 Oyster reefs are likely functionally redundant when near other structured habitats, such as saltmarshes and seagrass beds, that also produce and trap organic matter. When nitrogen was pulsed to simulate a storm event, reefs increased denitrification in all habitats, while denitrification in habitats without reefs only had a slight increase. It is likely that additional organic matter (i.e. biodeposits) delivered by the oysters prepares the sediment for enhanced denitrification in response to nutrient pollution. Denitrification efficiency, the percentage of nitrogen removed as N2 gas relative to the total amount of nitrogen delivered back to the system, was relatively consistent across habitats. Our results indicate that oysters augment sediment denitrification but the magnitude is dependent on location (i.e. proximity to other habitats). The habitat context of a restored oyster reef can significantly affect its delivery of ecosystem services and should be considered carefully in restoration and management plans. Modification of nitrogen cycling is just one of many reef functions that are affected by habitat context. Developing a more comprehensive framework of how ecosystem services are influenced by landscape- and ecosystem-scale characteristics and processes will enhance the efforts of resource managers to maximize the return on investment from restoration activities.